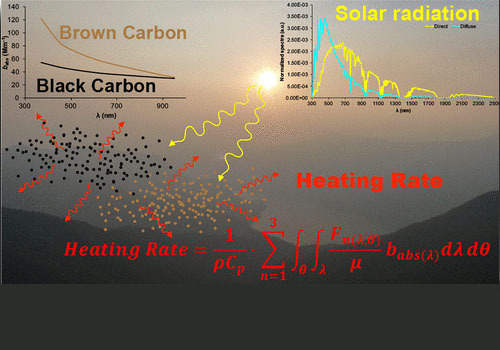 Scientific paper published in Environmental Science & Technology journal presents a novel methodology for experimental quantification of heating rate induced by light absorbing aerosols (LAA) (Black Crabon – BC and Brown Carbon – BrC) into an atmospheric layer. Multiwavelength aerosol absorption measurements, performed by the Aethalometer, were coupled with spectral measurements of the direct, diffuse and surface reflected radiation to obtain highly time-resolved measurements of heating rate apportioned in the context of LAA species (BC, BrC, dust), sources (fossil fuel, biomass burning), and as a function of cloudiness. One year of continuous and time-resolved measurements of heating rate were performed in the Po Valley, which allowed experimental determination of its seasonal behavior and daily cycle.